Should I go to Mass? Cardinal Neman to be declared a saint? Interested in Learning about Sacred Vessels? I have been asked a lot why I call myself "Moneybags" for a screenname. First off, I don't do this for greed as some would think. The idea for my screenname was a result of Monopoly. I love the boardgame, so I planned on calling myself "Pennybags". However, since I like to be original, I changed it to "Moneybags". Also, when I was very young I enjoyed playing the video game Spyro. And one of the characters on the game was named Moneybags. That was what caused me to take my original idea of Pennybags and turn it into Moneybags. I hope I cleared up any questions, and I hope you enjoy the blog! Note: This was my original username on the blog. Well, it's official that in the US, Samuel A. Alito Jr., has been nominated to the US Supreme Court and is enthusiastically supported by pro-life groups. To read the press release by the National Pro-life Action Center, visit this Washington Post article. Let's remember to thank God for giving us a pro-life nominee that will not only stand up for the unborn but all peoples that are unfortunate. Also, as Catholic Fire pointed out, if Alito is confirmed then five Catholics would be on the bench and represent a majority (Roberts, Scalia, Thomas, Kennedy, & Alito). And, if each one of them stood up for the Catholic beliefs on abortion, stem cells, euthanasia, etc our society would be so much closer to living by God's standards as He commanded us not to sin. Again, the issue here isn't at all like some think - taking away womens' rights. The issue lies in protecting the rights of the unborn child that it may have the ability for "life, liberty, and the pursuit of happiness". Let's pray Alito is nominated and stands up for the rights of all citizens so that no one is left behind to die but all are treated equally. I wanted to post today on November, which is the traditional month to especially pray for the souls in purgatory. I have outlined here a few past posts of mine that I'd like to share that could answer questions on purgatory. 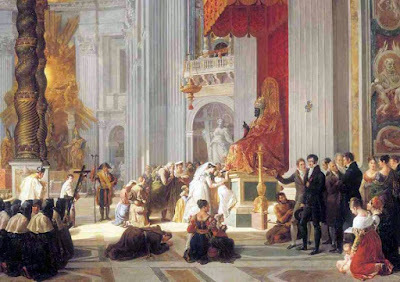 The recent Synod of Bishops in Rome spoke on many recommendations and one of which is to make homilies more apologetic (defending the Catholic faith). So, I would like to pass on these links to defend the faith and teach it and I hope others at their blogs will mention this month. These poor souls need our prayers since they can't pray for themselves in purgatory; let us pass on the word to pray, pray, and pray for them. 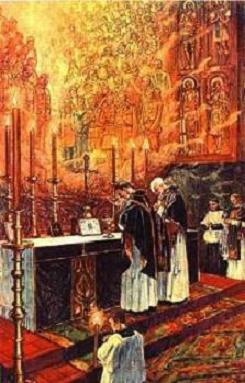 "The holy souls are eager for the prayers of the faithful which can gain indulgences for them. Their intercession is powerful. Pray unceasingly. We must empty Purgatory!" -- St. Padre Pio. One pain that is likely in store for most of us is the frustration that will come from the awareness that the living have the ability to grant ustremendous relief by offering fasts, alms, prayers, i.e., The Rosary, The Act of Reparation, The Acts of Faith, Hope, and Charity, The Stations of the Cross, and The Sacrifice of the Mass, etc., in suffrage for us, but are not doing so because they don’t realize they have this power to help us, nor that there is a spiritual treasury of the Church available for them to relieve us, nor that we even need their help, because we did not pass on to them these enduring truths of the faith. To gain a Plenary Indulgence form noon Nov. 1 until midnight Nov. 2, visit the church, pray for the Holy Souls and also for the intentions of the Holy Father. On All Soul's Day and for a week afterward, a Plenary Indulgence for the Holy Souls is granted for a visit to the cemetery with devotion and prayer for the dead. All through November, you can gain partial indulgence every day you visit the cemetery and pray for the dead. Learn General Information on the belief of Purgatory - it's biblical and dogma! 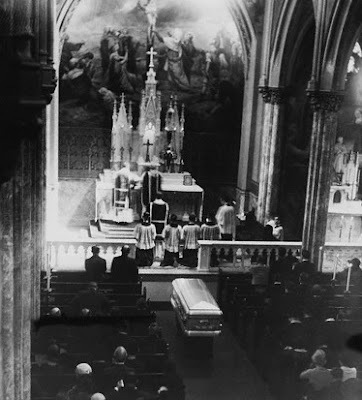 Can a Mass for the deceased help their time in purgatory? How Should We Care for the Bodies of the Dead? Today I am beginning a special 7-day long prayer for the poor souls in purgatory especially with All Saints Day and All Souls Day approaching. St. Padre Pio repeatedly called for prayers and prayed for the souls in purgatory as did many of our holy Pontiffs and saints of centuries past. Purgatory is a Catholic Dogma and a required belief of the faith. 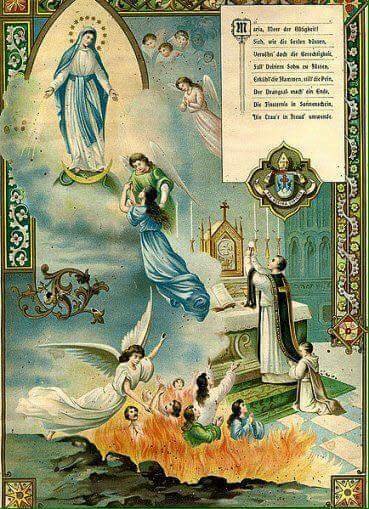 Our Lord once appeared to St. Gertrude and gave her a prayer for the souls in purgatory, and He promised that every time it was said that 1,000 souls would escape from purgatory. Our Father in Heaven, Your Kingdom come; Your will be done on earth, as it is in Heaven. Give us this day our daily bread; and forgive us our sins, as we forgive those who sin against us; and lead us not into temptation, but deliver us from evil. Amen. Hail Mary, full of grace, the Lord is with you; blessed are you among women; and blessed is the fruit of your womb, Jesus. Holy Mary, Mother of God, pray for us, sinners, now and at the hour of our death. Amen. Eternal rest, grant unto them, O Lord; and let perpetual light shine upon them. May they rest in peace. Amen. Merciful Father, hear our prayers and console us. As we renew our faith in Your Son, Whom You raised from the dead, strengthen our hope that all our departed brothers and sisters will share in His resurrection, who lives and reigns with Thee and the Holy Spirit, one God, forever and ever. Amen. 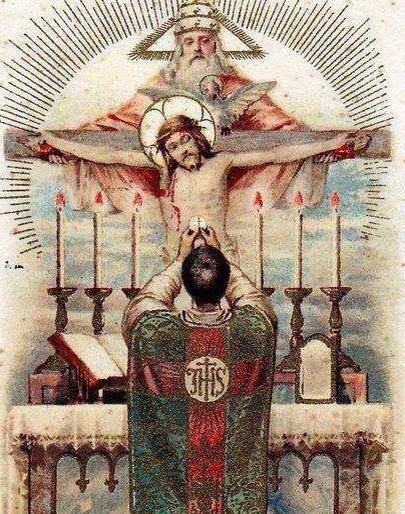 O Lord God Almighty, I beseech You, by the Precious Blood which Your Divine Son Jesus shed in the Garden, deliver the souls in Purgatory, and especially that one which is the most forsaken of all, and bring him into Your glory, where he may praise and bless You forever. Amen. Our Father. Hail Mary. Eternal rest, etc. O Lord God Almighty, I beseech You, by the Precious Blood which Your Divine Son Jesus shed in His cruel scourging, deliver the souls in Purgatory, and, among them all, especially that soul who is nearest to his entrance into Your glory, that he may soon begin to praise You and bless You forever. Amen. O Lord God Almighty, I beseech You, by the Precious Blood of Your Divine Son Jesus that was shed in His bitter crowning with thorns, deliver the souls in Purgatory, and, among them all, particularly that soul who is in greatest need of our prayers, in order that he may no longer be delayed in praising You in Your glory and blessing You forever. Amen. O Lord God Almighty, I beseech You, by the Precious Blood of Your Divine Son Jesus that was shed on the streets of Jerusalem, while He carried on His sacred shoulders the heavy burden of the Cross, deliver the souls in Purgatory, and especially the one who is richest in merits in Your sight, so that, having soon attained the high place in glory to which he is destined, he may praise You triumphantly and bless You forever. Amen. O Lord God Almighty, I beseech You, by the Precious Body and Blood of Your Divine Son Jesus, which He Himself, on the night before His Passion, gave as meat and drink to His Beloved Apostles and bequeathed to His Holy Church to be the Perpetual Sacrifice and life-giving nourishment of His faithful people, deliver the souls in Purgatory, and, most of all, that soul who was most devoted to this Mystery of infinite love, in order that he may praise You therefore, together with Your Divine Son and the Holy Spirit in Your glory forever. Amen. O Lord God Almighty, I beseech You, by the Precious Blood which Jesus Your Divine Son did shed this day upon the tree of the Cross, especially from His sacred hands and feet, deliver the souls in Purgatory, and particularly that soul for whom I am most bound to pray, in order that I may not be the cause which hinders You from admitting him quickly to the possession of Your glory, where he may praise You and bless You forevermore. Amen. O Lord God Almighty, I beseech You, by the Precious Blood which gushed forth from the sacred side of Your Divine Son Jesus in the presence and to the great sorrow of His Most Holy Mother, deliver the souls in Purgatory, and, among them all, especially that soul who has been the most devout to this noble Lady, that he may come quickly into Your glory, there to praise You in her, and her in You, through all the ages. Amen. I heard this story once from my parish's pastor, and it is a true story. One time in a religious education class the instructor asked her students, "What does it mean to be a saint?" One girl raised her hand and said, "I know the answer; I learned this from the stained glass windows in church - to be a saint means to let the light shine through." This prayer of St. Gertrude is the foundation of prayer for this site, and Jesus Christ, Our Lord, promised to St. Gertrude that whenever the prayer is said that 1,000 souls would be released from the fires of cleansing there. Think about the great wonders we could do and pray for these people that can't pray for themselves. Visit the Mission to Empty Purgatory and pledge some prayers. According to an article found via the Roman Catholic blog, Harriet Miers was never even Catholic when we all read that she was indeed a Catholic. I'm glad that after past evidence of her possibly being pro-choice and now this news, that another person will be nominated. 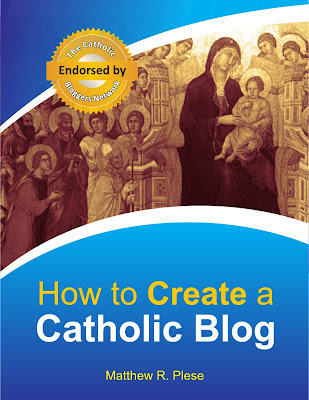 It seems that the blog, Christ-Haunted is down in readers. It's a very good blog and one of my favorites to browse through. I wanted to clean out my blog and was looking for suggestions on making it more user friendly. For example, do you think I have too many links in the sidebar? Which ones would you cut out? In response to a past post of mine on a Missouri pro-life law, I wanted to update everyone. Recently a bill became law in Missouri stating that abortion facilities have admitting privileges at a local hospital 30 miles from the center in case of a botched abortion. Planned Parenthood filed a lawsuit, but they have now withdrawn the lawsuit and the abortion clinic in Springfield, Missouri is closed! This radical humility is essentially the cornerstone of the Gospel. Without humility there would be no Savior because God would still be in Heaven where he rightfully should rest, but instead, He chose to dwell among us and humble himself to suffer hunger, thirst, work, and the Cross. Mary also humbled herself in such a radically way allowing Christ to take her body and turn it into the Ark of the New Covenant, where the greatest of all treasures would be kept. This is preciously one reason Mary is given the title Co-Redemptrix because she consented to be the Mother of God, but it is also because Mary plays a pivotal role in Christ’s sufferings and death. In no way, however, does the title of Co-Redemptrix mean that Mary was equal to God as she, herself, even needed a Savior because Christ saved His mother from sin. 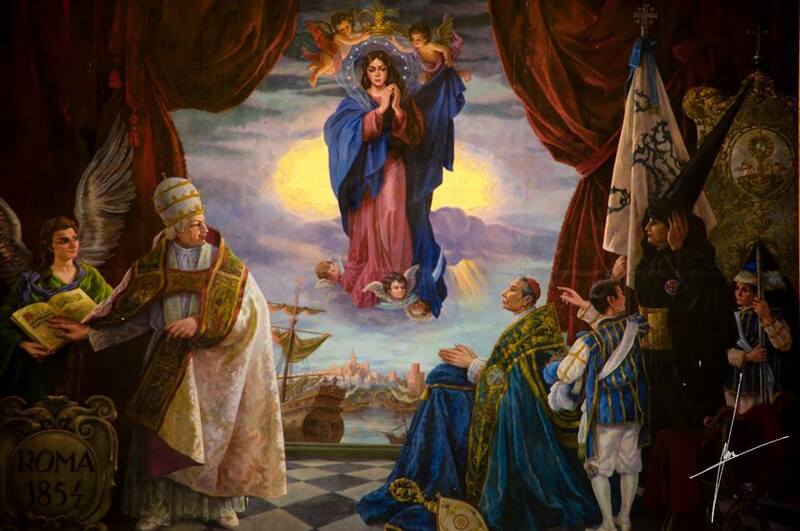 Without God’s role in Mary there would be no Dogma of the Immaculate Conception today. 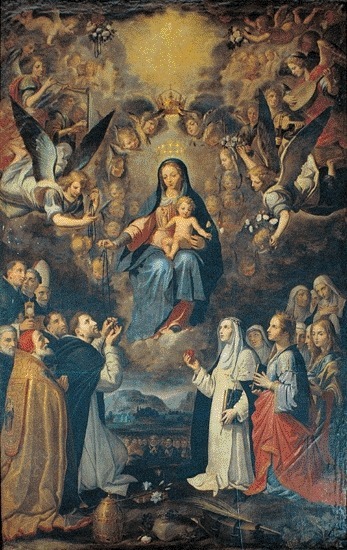 The special title of Co-Redemptrix, rather, is used to show the powerful aid of Mary in the beatific vision of Heaven. Mary is not only a special person in God’s eyes but also a faithful servant that is a “co-worker” in winning us our salvation and the salvation of the entire world. The prophecy of Simeon – recorded in Luke 2:35 – states, “And thy own soul a sword shall pierce, that, out of many hearts, thoughts may be revealed.” Namely, Mary would also suffer and endure great trials in life, but her ultimate faith in the Lord as expressed in “I am the handmaiden of the Lord” confirms how she was saved from actual sin. We too must look at Mary also as a shining example a of brilliant mirror reflecting God’s flowing light of mercy on which no blemish resides. Our mirrors remain tattered and some opaque, but Mary’s reflection of the light clears our paths. When speaking of the Redemption, we begin with objective redemption that began when Christ was conceived and completed in His Resurrection. During that period Christ fulfilled the prophecies of long ago and in dying one death he erased the eternal price of sin, which is eternal death. Three days later Christ rose from the dead, and we, too, believe that if we die in Christ we also will rise with Him. However, subjective redemption is also vitally important to the Christian faithful in reaching Heaven because even though Christ died for all not everyone will be saved because there will be people that reject His works. Christians have an obligation to grow in the faith by assisting Christ in obtaining their salvation. We believe that salvation can not be earned, but we do believe, as Catholics, that we have a responsibility to work towards our salvation and the salvation of others. This is precisely subjective redemption. Let me take one minute to help reiterate Catholic teachings on the necessity of works. In James 2:26 it states clearly: “For even as the body without the spirit is dead; so also faith without works is dead." Everyone, no matter if they are the highest kings or the lowly servants, must work today toward salvation, and Christ has promised that the lowly will be raised and the mightly shot down. Simply, if you are in grace you are saved, and grace is given freely by God so only He knows the state of your soul. This is precisely why frequently Confession is encouraged. Some Protestants will counter with Romans 3:28: "For we account a man to be justified by faith, without the works of the law," however this is not the correct translation in the Catholic Bible. In a Catholic Bible, all of the words are the same except one must remove the word “alone” because we go back to the original Greek, which did not mean “faith alone”. Rather, the word “alone” does occur but in James 2:24: “Do you see that by works a man is justified; and not by faith only?" The best explanation to account for the confusion between the Book of Romans and the Book of James is that St. Paul, in the Book of Romans, described the initial saving powers of faith. This view of salvation is acceptable but only for those that have not committed actual sin, namely children under the age of reason. The Book of James describes how one must continue to live the faith by showing how we love it. Just as Christ spoke of in the Gospel of Matthew, “Just so, your light must shine before others, that they may see your good deeds and glorify your heavenly Father,” so must we, with a sincere heart, have works that glorify God. My final thought on the necessity of works to assist in our salvation rests upon the Cross. We certainly must believe that Christ had great faith in the Father’s plan, and He adhered to it perfectly; yet, Christ also had works beyond compression. After all, the greatest work ever committed for the human race rested upon a wooden cross at Calvary. How would our lives have been different without that work? And it is precisely for this reason that we too must also work towards our salvation through the Sacraments, the Church, prayer, and many other wonderful opportunities one of which is devotion to Mary. Back to the topic of Redemption, I feel it fundamental to dispute a common claim among Protestants using the thought that Redemption occurs through death because death is the eternal price of sin so they conclude Mary did not die for Redemption and therefore took no part in it. This claim, however, lacks another scriptural basis in Genesis 3 where we recall that suffering also is a price for sin, as both Our Lord and his Mothers’ sufferings play a role in the Redemption of mankind. Mary suffered a tremendous amount by standing below the Cross watching Her Son die, and through her sufferings (Our Lady of Sorrows) we can begin to understand the different parts in her life where she suffered for Our Lord..
Mary’s suffering was united, not equal, with Christ and helped to become part of the work of our Redemption. Without God there would be no Redemption and Mary could not in any way have won for us eternal Paradise, but she once again was chosen by God for a special purpose to assist in our salvation, and for this reason she is called Co-Redemptrix. St. Jerome even stated, “By a woman the whole world was saved,” not signifying that Mary redeemed the world but that through her submission to God’s will, Our Savior came for us. I conclude with a look at the title of Co-Redemptrix, by stating another common dispute to Catholics: “I, the Lord, am your Savior, and your Redeemer, the Mighty One of Jacob,” so if Christ was our Redeemer how can Mary also be our Redeemer? And, I counter by reminding this person that it is through God alone that our salvation was won, but Mary participated in this work as well. We do not use the prefix “co” meaning “equal” but rather “part of”. Catholics firmly acknowledge God as the Lord, who won us our freedom from sin and death, but we also remember the pivotal role that Mary played in the sufferings of Christ that won us our eternal rest from all labor. Mary also was saved from sin when as she said called Our Lord, her child, our “Savior”, but Mary was saved from sin at another time. Mary was saved before her birth making her sinless at the moment of her conception and she remained completely in God’s grace: “Full of Grace” (Luke 1:28) This is the Immaculate Conception. Again, Christ alone saves us and by His blood alone were we saved (CCC. 432), but Mary also worked for our salvation. Remember, God doesn’t need anyone just as He didn’t need anyone to help Him at the Miracle of the Loaves, but instead Our Lord included the disciples. Here, Our Lord included Mary in being part of the salvation of all people. Note: For an updated list of the recent canonizations, please click here. These people are, like all other saints, true role models showing us that belief in Christ and following his Church is essential to Heaven. Follow the Church's teachings on all Dogmas and matters of faith including birth control, stem cell research, euthanasia, salvation, grace, the Sacraments, and all other issues. I haven't followed the Synod too closely, but I wanted to post a summary of some Synod news for readers. This Synod is a three week assembly on the Eucharist and the first synod under Pope Benedict XVI during what better time than during the end of the Year of the Eucharist. Note: Links below are to the National Catholic Reporter. I do not endorse all - even most - of the content. "For I have received of the Lord that which also I delivered unto you, that the Lord Jesus, the same night in which he was betrayed, took bread. And giving thanks, broke, and said: Take ye, and eat: this is my body, which shall be delivered for you: this do for the commemoration of me. 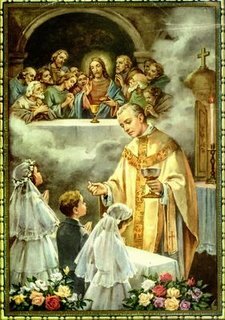 In like manner also the chalice, after he had supped, saying: This chalice is the new testament in my blood: this do ye, as often as you shall drink, for the commemoration of me. For as often as you shall eat this bread, and drink the chalice, you shall shew the death of the Lord, until he come. Therefore whosoever shall eat this bread, or drink the chalice of the Lord unworthily, shall be guilty of the body and of the blood of the Lord. But let a man prove himself: and so let him eat of that bread, and drink of the chalice. For he that eateth and drinketh unworthily, eateth and drinketh judgment to himself, not discerning the body of the Lord. Therefore are there many infirm and weak among you, and many sleep" (Douay Rheims). With statistics now out for 2003, the Catholic population grew by 15 million and on all continents but Europe where it fell be slightly over 200,000. I pray the Church grows and all Christians become united in the One, Holy, Catholic, and Apostolic Church one day. Only through prayer and example can we make Christ's prayer in the Garden true: "...That they might be one." Today is World Mission Sunday and a day centered on living our lives for God as the Mass readings today illustrate the two greatest commandments. At Mass this Sunday I was very happy to participate in a Rosary service called the "Living Rosary". I was originally told to lead the Rosary, but another person decided to be the leader a few days ago instead of me. Overall, it went beautifully. The event began as a tribute to Mary and a close to the Year of the Eucharist during the 6th and 7th grade religious education classes' annual Mass. Through the living Rosary a person comes to represent each bead of the Rosary and he/she takes a rose and stands around the Church after each prayer. 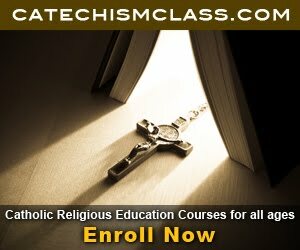 After the CCD (religious ed.) students each took one rose and gathered around the Church, members of the congregation slowly rose from their pews to join them; at the end I also was in the circle around the church with a rose all praying the Rosary to Our Blessed Mother. At the end both old and young alike stood together making a circle around the Church praying the Rosary. I admit that I was there nearly 2 hours (this being my second Mass for the day), but it was an amazing spiritual experience. Well, it's been one week since someone took my Rosary from Mass along with a prayer booklet of mine. I thank everyone for their prayers, but I have not found it. After Mass today I talked with several people from Father to the ushers to the cantor. All were very hurt that such a thing happened and I truly appreciate their support. I hope that whoever does have it is using it since I doubt I can ever find it. After Mass, Father said he wanted me to take a Rosary he found to make up for mine. It is very, very nice and has turquoise beads and a medal of St. Patrick that says, "Pray for us". I thanked him deeply for such a great Rosary, and the cantor also wants to bring me a Rosary - this one from Fatima. Now I'm trying to find the same prayer booklet of St. Padre Pio themed on the Eucharist online because Father has offered to order it for me. Thanks for all of your prayers. I'll keep everyone posted on my Rosary. Don't Support "Save Lids to Save Lives"
The program "Save Lids to Save lives" on Yoplait Yogurt containers should not be supported. The money donated goes to the Susan G. Komen Breast Cancer Foundation, and I was going to send some lids away because for every lid $0.10 goes to the foundation. However, I did some research and discovered this Foundation is a supporter of abortion. "The Komen Foundation took in $153 million in 2003, and much of it probably went to finance good causes. But in 2003 the foundation also donated $475,000 to Planned Parenthood, America’s largest abortion provider" (Source: Toronoto Free Press). Update: According to LifeNews in December 2006, the Susan G. Komen foundation gave more donations to Planned Parenthood. As Catholics and Christians or even people of other faiths that value life from God, we must not support abortion in any way. Abortion, no matter what way you look at it, ends with death - death not in accordance with God's time but with our own. Abortion should be considered murder, and I can not send away anything to any foundation financing, even in part, such a horrible cause. January 2012 Update: The National Office (not affiliates) have at least temporarily suspended donations to Planned Parenthood. God is the God of the living. As Matthew 22:32 says: " 'I am the God of Abraham, and the God of Isaac, and the God of Jacob'? He is not God of the dead, but of the living.'" Our souls never die or "sleep" but after death, we are judged. Those that enter Heaven live in joy forever. These are saints. Also, when Moses and Elijah appeared at Jesus' transfiguration, were they not alive in God or were those simply manifestations that Jesus called forth? It's clear they were alive. After a whole chapter describing the ancient people of faith in Hebrews 11, Hebrews 12:1 goes on to say, "Since we are surrounded by such a great cloud of witnesses..." What possible interpretation can anyone give but that those who have died are aware of us and are watching us? The Dying St. Dominic to his brethren: "Do not weep, for I shall be more useful to you after my death and I shall help you then more effectively than during my life." The winner in our poll for the next saintly topic was St. Teresa of Jesus (also called St. Teresa of Avila) who is a Doctor of the Church and a Carmelite. We recently celebrated her feast day on Oct. 15th. She was the first woman to be declared a Doctor of the Church in 1970 and in 1660 she was canonized a saint by Pope Gregory XV. I think she shows us what many saints do is that it is not what happens to us in the beginning that makes us a saint but what we do about it. We are all called to be saints and the only way we do is if we trust in the Cross and pray that our actions show that God's will, not our own will, may be done. 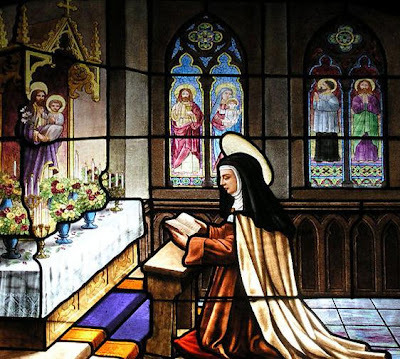 Let's try and follow her advice: "You ought to make every effort to free yourselves even from venial sin, and to do what is most perfect," because as Christ, Our Lord and God, taught, all sin is wrong and we should rather take away our hand than have be sent eternally away from His love. Even if you believe so or not, it is His love that consumes us and makes us whole. With today being Friday I plan to pray the Stations of the Cross. But, since today is also a day of remembering Mary's sorrows it is an appropriate day to pray Chaplet of the Seven Sorrows of Mary. Remember, today is a day of penance. John Henry Cardinal Newman may become England's first canonized saint after the Reformation. A miracle attributed to him was revealed by a 60 year-old deacon whose spine was healed after prayers for Cardinal Newman's intercession. I just found these two new blogs and really liked them. The first is In Veritate Ambulare,which is starting a series on sacred vessels. I think it's a great topic and the current post on it is on the ciborium. The second blog is The Inspired Traditionalist, another good blog. As we look at the Hail Mary we see part of the Archangel Gabriel’s address in the exclamation: “full of grace”. Grace is defined as a supernatural gift from God’s infinite goodness given by God to His sinful people for their eternal salvation. Mary is addressed as “full of grace” which shows that she must be in complete favor of God to have earned the fullness of God’s grace. This particular instance is a special one, in which God chose Mary to be conceived sinless to make her a house for God to dwell within. Both Jesus and Mary are perfect although for different reasons; Jesus is God and therefore is without sin and therefore must be perfect. This is shown through Magesterium teachings, scripture, and definition. Sin, which is defined as “distancing oneself from God,” can not have any part in God because it is impossible for God to be distancing Himself from Himself. Mary, though, is perfect, but she was made perfect and preserved from sin by Her Son, who is eternal and preserved her before He became flesh. In fact, the traditional collect prayer from the Mass of the Immaculate Conception well summarizes this: "O God, by foreseen merits of the death of Christ, You shielded Mary from all stain of sin and preserved the Virgin Mother immaculate at her conception so that she might be a fitting dwelling place for Your Son. Cleanse us from sin through her intercession so that we also may come to You untainted by sin. Through Our Lord." Some point to the second line of the Magnificat with Mary proclaiming, "And my spirit rejoices in God my Savior," stating the use of "savior" means Mary could not be free from sin. The answer, of course, is that Christ did save Mary -- He simply chose to save her prior to her birth -- the difference in methodology in no way detracts from the outcome of the act. 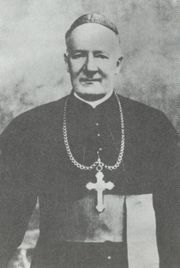 Pope John Paul ll described this in 1998 as “Having become pure capacity for God, Mary made her life constant cooperation with the saving work carried out by her Son, Jesus.” Likewise, the Dogma of the Immaculate Conception, which was not defined until 1854, stated that "The most holy Virgin Mary was, in the first moment of her conception, by a unique gift of grace and privilege of almighty God, in view of the merits of Jesus Christ the Redeemer of mankind, preserved free from all stain of original sin." It is true that the early Christian fathers did not teach the Immaculate Conception using the words "Immaculate Conception", but many of the Fathers professed this belief; the writings of some early Christian saints were some of the earliest writings alluding to the Immaculate Conception and helped to create the future Dogma of the faith. For instance, St. Ephrem (306-373) also wrote alluding to Mary’s sinlessness: "You and Your mother are the only ones who are totally beautiful in every way. For in You, O Lord, there is no stain, and in Your mother no stain." 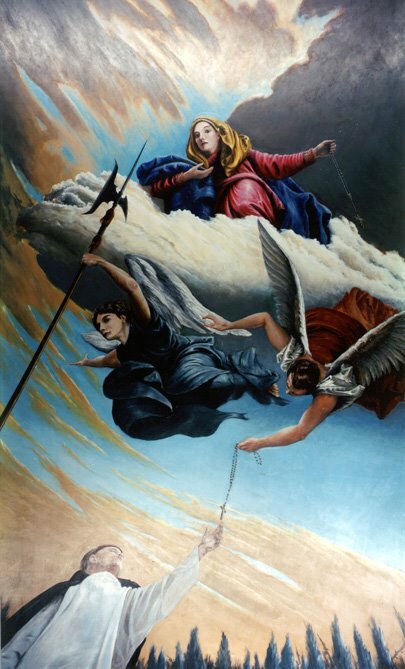 A Dogma was never issued before for the Immaculate Conception because it is was not necessary as all Christians at that time did not hold grudges against the Mother of Our Lord as some today seem to possess. Once again, it makes perfect sense that the Mother of God does not have sin upon her soul because Christ Himself must dwell within her. Other Christian groups have said that Mary is important as the Mother of Christ but they say no more. In truth, Mary is essentially important to the Christian life as the Mother of Christ and as our Mother, who Christ gave to us through His disciple John. I view the Dogma of the Immaculate Conception through a common sense approach already stated where Christ could only dwell in a person free from sin because sin is evil and an offense against God’s perfect law. We, as Christians, believe God is the perfect goodness, and likewise, we believe sin is the absence of goodness, where God is the perfect goodness. Therefore, I can conclude that sin is evil and a lack of God’s saving grace, even if only momentary but a clear distance from God remains because we are not perfect like He. It is through our first sin that we lose our innocence and must work towards salvation as all people must do except those exceptions including the Blessed Virgin Mary, whose radiant light kept pulsing harmoniously from her soul through the grace of God, Most High. Scripture attests to the Immaculate Conception as well though I feel it initially fundamental to dispute a common claim among other faiths that Catholics are in opposition to scripture on this matter. They state Romans 3:23 which reads, “For all have sinned, and do need the glory of God,” however this verse only shows that all are subject to the stains of original sin on the soul. Remember that Christ chose to save His mother from this sin in order to come into the world, but I also see it as a deep reverence for His mother in accordance with the fourth Commandment: “Honor thy mother and father.” It is quite clear that Christ showed great love for His mother already, and He showed even more through the Coronation and Assumption, which I will address at length further into this book. Moreover, Romans 3:23 uses the English word “all” in place of the Greek word “PAS”, which was not the absolute that “all” encompasses today. I think this further highlights how even the best of translations are nothing compared to the original scriptures. This word taking the English term “all” is also seen in Matthew 3:5-6 and Luke 2:1 to name a few others where it is not the absolute that we see it meaning. For example, Matthew 3:5-6 states, “At that time Jerusalem, all Judea, and the whole region around the Jordan were going out to him and were being baptized by him in the Jordan River as they acknowledged their sins.” I certainly do not believe that the entire region went to the Jordan River including those that did not believe in the faith. I view it much more probable that a great majority went out, not everyone; it is clear that the word “PAS” meant a “just about everyone there is, but maybe not literally everyone,” better than it did “all”. Furthermore, I feel it essential to state that Martin Luther, the man that began the Lutheran Church and broke away from the original Catholic Church, still held a great devotion to Mary including a belief in the Immaculate Conception: "It is a sweet and pious belief that the infusion of Mary's soul was effected without original sin; so that in the very infusion of her soul she was also purified from original sin and adorned with God's gifts, receiving a pure soul infused by God; thus from the first moment she began to live she was free from all sin." Further knowledge of the Christian faith continues to disprove the use of Romans 3:23 to be used against the Immaculate Conception. We as Christians believe Christ was free from sin but the verse does not even say “all but Christ”. We also believe that the mentally disabled and infants cannot commit actual sin even though the verse does not specifically state this fact. Simply, Romans 3:23 must be translated using correct Greek and there would be no remote opportunity to oppose Magesterium teachings in that instance. I, though, do not see the point in tearing down the teachings of the Catholic Church concerning Mary as it is through Mary that we have a powerful intercessor and loving Mother that spares nothing from her children. Onward, scripture does word the words "Immaculate Conception". Sacred scripture nevertheless holds vast information on Mary, but we must not just read the words but meditate on each and every statement as a truth given to us by God. The Bible begins with the book of Genesis, an account of creation and the fall, and this is the first place that Mary is referenced. In Genesis 3:15 it states, “I will put enmities between thee and the woman, and thy seed and her seed: she shall crush thy head, and thou shalt lie in wait for her heel." This verse is the first verse that references to mankind’s Redeemer since Jesus Christ came to destroy sin, Satan, and death. 1 John 3:8 further says, “The Son of God appeared that He might destroy the works of the devil,” who came into being through a love for men that far excesses our senses, where one would come to die for all of us while still enemies. This “enmity” in Genesis 3:15 is not between the man and the serpent but the woman and the serpent. Church teachings are that this is in reference to Mary, the one to come and destroy the serpent because of allowing Our Lord to take flesh within her. Also, it is critical to reverberate Magesterium teachings of Christ being the Second Adam. We all know that through Adam and Eve sin entered the world and it was through Christ, one man, that sin left the world by his death on the Cross. Yet, just as Eve assisted Adam in losing the faith by offering him the apple, Mary offered Christ her body to come and become man and assisted in bringing Our Lord to us. Out of all people Christ chose Mary as His mother and has given her to us as well; how breathtaking. Christ is called the Second Adam since creation was renewed through Him, and Mary is the new Eve who works alongside Our Lord. We also know that the only one that can bear the sins of the entire world is God because He is both human and divine and any action of His, whether in his divine or his human nature, is of infinite value. This is how dying one death ended all of our eternal deaths. We could pay the price for sin, but that would be eternal death; instead, Christ chose to free us from the punishment that we deserve out of a love so fervent that He would humble himself to death even death on a cross. Back to the verse in Genesis, we see reference to Christ by God’s statement that refers to the woman’s offspring. Some translations of the Bible use the word “seed” instead, but the main motive is still intact. This claim that through the women would be offspring, namely Our Savior is quite revolutionary. We already know that God knew of the need for a savior in the beginning, so in this verse, He speaks of Adam and Eve’s offspring, which would include Christ. This conservation to the women that she would bear offspring, rather than to the man, shows that through a woman Our Savior, who the entire world resides inside, would be born. While scripture does refer to her offspring it also alludes to Christ, who has freed the entire human race through His sacrifice on the Cross where we become part of Him in dying so that we may also see the Resurrection. The entire human race was relying on Christ’s sacrifice, which is alluded to in the book of Genesis although not directly because the people of the Old Testament would not have understood. Continuing with the verse in Genesis, a special relationship is seen between the woman and the serpent, and this relationship is one with enmity. “Enmity” is certainly an intense, powerful word beyond hatred and defined as “deep-rooted hatred”. We see by looking back to Genesis 3:15 that God Himself will place this enmity between the serpent (Satan) and Mary, who is the second Eve. It is clear that Mary is to be the personal enemy of Satan not Christ. Christ came to destroy the devil’s evil works, but God chose to make Mary as Satan’s personal enemy. From the beginning, God had a plan for everyone with all of us able to reach Heaven if we chose, and Our Lord chose to save Mary from sin. 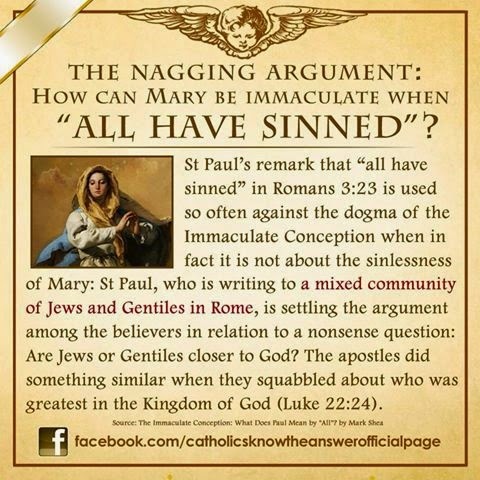 This also put the enmity between Mary and Satan because Mary had no sin and was perfect and clearly saw the wrongdoings of the devil; she hated them because she was completely in God’s favor. We as sinners can fall into sin, but Mary was preserved from original sin and remained sinless in life, which made her Satan’s personal enemy. As the Catechism of the Catholic Church explicitly reveals, “Throughout the Old Covenant the mission of many holy women prepared for that of Mary. At the very beginning there was Eve; despite her disobedience, she receives the promise of a posterity that will be victorious over the evil one, as well as the promise that she will be the mother of all the living. By virtue of this promise, Sarah conceives a son in spite of her old age. Against all human expectation, God chooses those who were considered powerless and weak to show forth his faithfulness to his promises: Hannah, the mother of Samuel; Deborah; Ruth; Judith and Esther; and many other women. Mary "stands out among the poor and humble of the Lord, who confidently hope for and receive salvation from him. After a long period of waiting the times are fulfilled in her, the exalted Daughter of Sion, and the new plan of salvation is established." Mary had a special purpose, and this purpose was to become the Mother of God and help us achieve our salvation. She cannot save us, but her constant motherly presence pleads continually for our souls. I have written a rather long but, in my opinion, sufficient explanation of the Immaculate Conception Dogma, which states that Mary was conceived free from sin. If anyone would like to read this please just ask though it is about 3 pages long. This is the first Catholic Composition Project, a project looking to add scripture and support to help those new to the faith understand and have a one-stop-shop for information. I'd like any help I can on getting references from the CCC for the Immaculate Conception, links to good sites on it, or quotes by saints. Today is the feast day of St. Luke, patron saint of physicians, surgeons, goldsmiths, painters, bachelors to name a few. He wrote the Gospel according to St. Luke and the Acts of the Apostles in the Bible. His name literally translates to "bringer of the light". According to tradition, he also painted the first icon. St. Luke was born a pagan in Antioch in c. 74 and possibly was a slave. He was one of the first converts. St. Luke met St. Paul at Troas and evangelized Greece and Rome with him. During Paul's two years in prison, St. Luke stayed in Rome. St. Luke died a martyr. 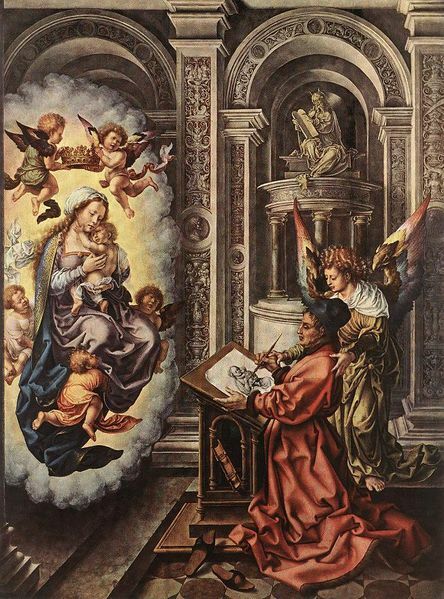 "According to tradition he was an artist, as well as a man of letters; and with a soul alive to all the most delicate inspirations, he consecrated his pencil to the holiest use, and handed down to us the features of the Mother of God. It was an illustration worthy of the Gospel which relates to the divine Infancy; and it won for the artist a new title to the gratitude of those who never saw Jesus and Mary in the flesh. Hence St. Luke is the patron of Christian art. "- Excerpted from The Liturgical Year, Abbot Gueranger O.S.B. Foods this day to honor St. Luke would include some beef dish, as he is the patron of butchers. So perhaps a nice cut of steak would be in order? For dessert, bake some raisin Banbury Tarts to evoke the festivals of England on this day, or a cake in the shape of a book with decorations of a calf or ox for this evangelist. This day is also "St. Luke's Little Summer," a period of summerlike days that occur around October 18 (like the term "Indian Summer," which officially occurs between Nov 11-20), named to honor the saint's feast day. In the past, St. Luke's Day was not observed by the secular world as much as St. John the Baptist's Day (June 24) and Michaelmas (September 29), so to keep in the forefront, St. Luke gives us some golden days before the cold of winter. Let holy Luke, Thine Evangelist, we beseech Thee, O Lord, intercede for us, who for the glory of Thy name ever bore in his body the mortification of the cross. Through our Lord. American Girl has recently come under fire and for good reason: it is in support of gay marriage and abortion rights. Until they stop funding and/or supporting directly or indirectly abortion and gay marriage I will not buy any of there products and encourage others to do the same. Legend also says that St. Ignatius of Antioch was the infant Jesus held in the Gospel of Mark Chapter 9. 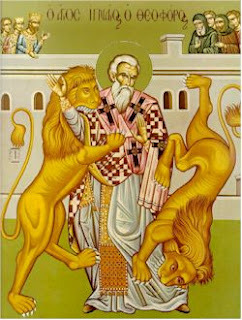 St. Ignatius of Antioch was born in c. 50 AD and succeeded Peter as the Bishop of Antioch. In 107 AD, St. Ignatius of Antioch used the term "Catholic Church" for the first time, which described the universal Church established by Jesus Christ. In c. 107 AD, St. Ignatius of Antioch died as a martyr. Before his martyrdom he wrote many letters like the one below. He is also an Apostolic Father. Look down upon our weakness, almighty God; and since the weight of our own deeds bears us down, may the glorious intercession of Blessed Ignatius, Thy Bishop and Martyr, protect us. Through our Lord. I am writing to all the churches to let it be known that I will gladly die for God if only you do not stand in my way. I plead with you: show me no untimely kindness. Let me be food for the wild beasts, for they are my way to God. I am God's wheat and bread. Pray to Christ for me that the animals will be the means of making me a sacrificial victim for God. The prince of this world is determined to lay hold of me and to undermine my will which is intent on God. Let none of you here help him; instead show yourselves on my side, which is also God's side. Believe instead what I am now writing to you. For though I am alive as I write to you, still my real desire is to die. My love of this life has been crucified, and there is no yearning in my for any earthly thing. Rather within me is the living water which says deep inside me: "Come to the Father." I no longer take pleasure in perishable food or in the delights of this world I want only God's bread, which is the flesh of Jesus Christ, formed from the seed of David, and for drink I crave his blood, which is love that cannot perish. Pray for me that I may obtain my desire. I have not written to you as a mere man would, but as one who knows the mind of God. If you ask yourself that question than read this site. Part of it: "For every Mass we hear with devotion, Our Lord sends a saint to comfort us at death (revelation of Christ to St. Gertrude the Great)." Mary once told her faithful servant Alain: "My Son so loves those who assist at the Holy Sacrifice of the Mass that, if it were necessary, He would die for them as many times as they've heard Masses." Today was scheduled to be a normal Sunday where I just go to Mass and not have to participate. So, I brought my rosary and a great St. Padre Pio prayer book with prayers to the Eucharist (one of the litany of the Blessed Sacrament, my favorite litany.) About 5 minutes before the start of Mass, Father came over to me and said the lector had not showed up, so he asked if I could lector since I am a lector some Sundays. I served as a lector on shorthand notice. But, after Mass I went back to my first pew and found out that my Rosary and prayer book were taken by someone. I haven't found them yet and only can pray I ever will. Please say a prayer that I might get these back. 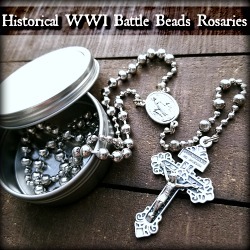 That was a very special Rosary, and I don't think I can ever replace that prayer book. I sent away for these prayer cards of Pope John Paul ll and Pope Benedict XVI and only had to include a self-addressed stamped envelope. I printed the form out and just filled it in and mailed it away. I recently got the prayer cards and liked them very much, so I thought others here may also want to send away for them. And if you are looking for beautiful holy cards, please remember to check out "Holy Cards for Your Inspiration." Today the Church remembers and celebrates the life of St. Teresa of Avila (also called St. Teresa of Jesus). St. Teresa was born on March 28, 1515, in Spain, and she loved Our Lord since her youth. St. Teresa would even play "hermit" in her garden. At the age of 12, St. Teresa's mother died, and she prayed for Our Blessed Mother Mary to be her new mother. St. Teresa was very weakened by a serious illness in her youth, and she was healed through the intercession of St. Joseph. At 17 she left home and entered a religious order but initially her father would not accept it. Finally, after seeing the conviction in his daughter, he consented to her entering the consecrated life. St. Teresa was soon ill again, and she never fully recovered. During this time of spiritual growth, St. Teresa received many visions approved as authentic following examinations by Dominicans and Jesuits, including Saint Francis Borgia. She founded a reformed convent after thinking her current one was too lax in rule. She was a mystic and a great writer, who wrote one of my personal favorite books, Interior Castle. 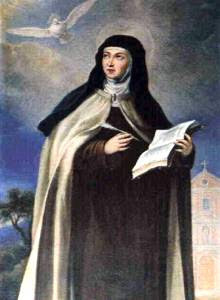 On October 4, 1582, St. Teresa of Avila died in the arms of her secretary and close friend Blessed Anne of Saint Bartholomew. Her body is incorruptible. She was canonized in 1622 by Pope Gregory XV. Graciously hear us, O God our Savior, and grant that as we rejoice in the festival of blessed Teresa, Thy Virgin, so we may be nourished by her heavenly teaching, and grow in loving devotion towards Thee. Through our Lord. Do You Want to Save Someone's Life? Today is the Sanctity of Life Day!